You are here: Home » Interfaith Marriage, Islamic Answers 2011, Marriage to non-Muslims » I’m a Christian woman marrying a Muslim man. Do I need to wear veil? I’m a Christian woman marrying a Muslim man. Do I need to wear veil? 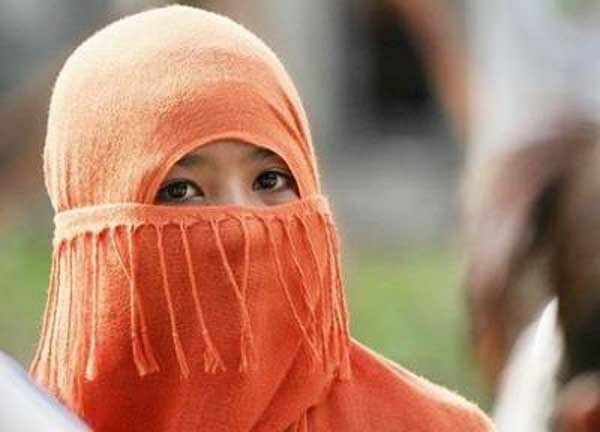 A veiled Muslim girl in the southern Philippines island of Mindanao in February 2008. I'm a Christian woman married with a muslim man. He told me that according to the Islam Law I have to wear the veil. I knew that being a christian I am not obligated to wear the veil. I am a catholic woman who veils, and by veiling I mean only showing my face, my hands, and my feet. It sounds difficult, but i just means wearing a long sleeve top and long skirt/pant with a head scarf. You don't need to buy special pins, I just wear a folded square scarf feom macy's tied around my neck 'russian style'. Islamicly your husband, even if you were a muslim, cannot tell you what nor what not to wear. It's 100% your choice if you want to veil or wear short-shorts tomorrow. (Unless you're in a mosque or breaking the law like in Iran) You should ask him why he wants you to veil. If it is only from a religious stand point ask him to bring you evidence showing that wives married o muslim men must veil, not should veil ala emulating the wives of the prophet. If he really just feels embarraed by your revealing clothes, maybe you can compromise via no longer wearing mini skirts and he return stops wearing something you dislike like haiwaiian tops. broadcasting you're a Christian, not a muslim. Arab Christians also veil in a way similar to muslim women. Just please Do not feel you're a hypocrite though if you veil as a christian, I do to be closer to God and because modesty os a virtue not limited to muslim women. Dear Azul, lovely to hear from you and further nice to hear that some Christians are also adhering to the modest dress code that Jesus (may the peace and blessing of Allah be on him) would have encouraged. Dear Eli81, Azul has made a good point, that modest dressing/veil is for Christian women too. Having said, that your husband cannot force you to wear hijaab. He married you as a Christian so he should not expect such things from you. Of course, if you were wearing bikinis or other revealing clothes in public, I could understand his dissapproval. But Hijaab is another matter altogether. Perhaps you could remind him of the above. At the same time, perhaps you could look into the benefits of living an Islamic lifestyle for yourself. Seeing as you have married a Muslim man and will be having children togtether, it makes sense to try and understand the religion, it is an extension of Christianity and Judaism. You may even be drawn towards accepting it. But why do you say Unless you're in a mosque or breaking the law like in Iran. Do you feel like Iran people break law or you just felt like saying it. In Iran hijab is mandatory by law, people who do not follow it get fined and integrated by the police. In a mosque it's mandatory by social and cultural customs (99% of the time, there are mosque in Turkey that are historical sites rather than houses of worship). If her husband told her to veil while in a Mosque he is in the proper place, the same way he'd be in the proper place since she'd be breaking the law sans hijab in Iran, and she should follow his words. I hope that cleared things up, I'm trying to present situations where hijab/veiling is not a choice. I do not understand why these issues come up to be dealt with after marriage? Did you both not discuss this before? If he married a woman without veil, why is he wanting her to quickly adapt the veil after marriage? One of the things Muslim men who marry Christians know well about the Sharia is " they are allowed to marry from the People of the Book". They miss a word there I think " virtuous" women from the People of the Book. And that one word has a wide meaning. It is your husband who needs to know that changing someone from a different back ground overnight by imposing "sharia" on her is not a suitable option. Even almost a majority of Indo-Pak Muslim women do not wear veil or Hijab, then how about making a Christian do it immediately after marriage? In Islam nothing is by force. I agree with sister Z's point of learning more about Islam. You should learn more and he should also learn more so as to make Islam a "peace point" of your life and not using it to make a mess out of this marriage. Islam has certain guidelines and a peaceful, reasonable way of approach to living Islam can lead to the fullest enjoyment of life. Try this. The "veil" of the heart is as much important as the outer covering. First we need to have that. And for that a woman needs to understand her duty towards God and she can understand it in the Straightest way, without any crookedness to know the will of God, is by reading the Qur'an. Read it with meanings. See if it makes you hear a call, if you feel it is the Truth, go for it. Just give it a try. Read the Qur'an together with meanings. Take things peacefully, ask him to be patient and tell him you come from a different back ground and may take time to adjust. Insha Allah, with passing time you both may have better understanding between each other and live happily. May Allah ease this for you. Excuse when you said its okay for her fiance to marry a woman from the book.Sorry I was a little confused are you saying it's okay for muslim men to marry christian women.The Quran says thats okay? Yes, it's allowed for a Muslim man to marry a Christian woman, though I personally do not recommend it. Marrying a Muslim Man to Chritian/Judaism girl is permitted in Islam.In Practical life, there will be lot of influence of chritian /Judaism wife to make children grow in chritian/Judiaism beliefs, as Muslim father you can give name but in reality true Islamic education to give to children should come from both the parents, if one is muslim and another is chritian then chritian mother tries to imbibe her religious implications on the children, then there comes a conflict of relegion. children will be more confused and cannot happily practice islam. I advice you, to think more seriously on having Muslim wife and relieve your stress to make them muslims always.A Man is always busy in earning the bread and cannot spend more time with the childre while christian wife will take this chance and make children to deviate from mainstream of ISLAM. As Islam does not allow a Muslim Man to force his wife to do conversion as this prohibited in QURAN. Religion is not a compulsion in ISLAM, so before going to a marriage with christian wife you are taking a challenge for whole life time to make her understand about ISLAM but all it goes to invain until unless Allah subhana thaala bless her with ISLAM. You cannot travel in two boats simultaneously then how can it be possible that you can be ISLAMIC but want to travel with Christian wife. Once all the initial love wades away llike a burning candle then comes all the challenges in life. Even by being a christian you can wear a scarf to hide your body in the Torah jesus said that you don't have to unhide youyr body but hiding your face is optional. You hide your hands except for the palms ,hair , feet and all the other parts but hiding your face is optional. PLEASE REPLY. i hope you believe soon inshaallaah. belief doesnt just mean believing in god, but also believing in all the angels, that they are reality, in all the books from god which are his spoken words, including the qur'aan, belief in all the messenger&prophet including muhammad saww [in which case you become a muslimah], belief in the hereafter, and the predestination both its good and bad. i would like to ask if a married christian women before embrace islam can get marry with a muslim man? Obviously not. How can a married woman marry someone else? If you are involved with this woman, then you need to stop your involvement immediately. If you want more detailed advice, please log in and write your question as a separate post. She possibly means if she gets divorced can she marry him? It depends how she was married as a Christian. If she was a Roman Catholic they will not recognize divorce except under very special circumstances. hi, i am about to get married to a mualim saudi man and i know i have to wear a hijab in the mosk. i am christian and was wondering if he will expect me to wear one after we get married too. Also, i am wondering if during the wedding i have to cover my arms and legs too. i have no idea what to do and i am just curious as to what to do. Also i am curious about the binding process, is there a marriage lisence we have to sign, or any thing with legality? I think it would be good for you to discuss your concerns with your husband to be. At the same time, I also think it would be very useful for you to read through the many questions asked on this website about similar matters. Marriages between Muslims and non Muslims do not always work out very well, because the personal beliefs are so different. Your fiance may be showing happiness in marrying you now, but have you thought about how you will feel when you have children. Will you want them raised as Christian or would you be happy for your husband to raise them as Muslim? This is just one of many issues that will arise. You are most welcome to write here, but the fact that you are having to write here to ask simple questions about what your husband will expect of you after you marry and what the marriage contract consists of, tells me that your current level of communication with your fiance is not very good. Just something for you to think about. If you have any further queries, please log in and submit your question as a separate post. Although SisterZ has provided you with much information but dear marriage is not all about you and this man. What about marriage rights, where do you both plan to live, children's religion, how much you can change yourself to make this marriage successful? Also, compare rights/practices of women in Saudi Arabia in US or Where ever you live. What if (just a possibility) you both divorce, who will take the custody of children. Is his family willing to accept you; remember sister 90% or more times foreign women in such marriages face difficulties in such marriage and IT REQUIRES AWFUL LOT OF PATIENCE. More so, Saudi Arabia is the country where our beautiful religion was revealed and we love cities like Mekkah and Madina but ironically women are not allowed to exercise/practice their Allah gifted rights. For instance women cannot drive alone and I was told that still in most cases women who want to work/study have to face a lot of resistance (most cases). Also, what about the marriage contract? Take your time sister; read other posts here on this forum and if possible and you know someone married to Saudi man then ask them. Please read the replies to this post. Thank you for what must have been the most helpful answer on this site. I am Christian, but believe in tolerance and sharing beliefs between all human beings. My next door neighbours are devout Muslims and we are sincere friends. May our God bless all people of The Book and help us solve our earthly differences. As Christian women, we are called to submit to our husbands in all areas that do not cause us to sin. The Bible is very clear that when women pray and prophesy, we are to have our heads covered(1 Cor. 11:5-15) , and that we are to pray without ceasing (1Thess. 5:17). Combining these two scriptures, I can see only benefit in having your head covered. You have chosen a hard road, because you have married outside of the faith. (This is not to say that Muslim men do not believe in GOD, but that they do not share a similar faith in our Lord Jesus Christ.) I pray for you and your family that you may find a way of peace, unity, love, and holiness that pleases GOD. Remember, dear, in all things that do not cause you to sin, submit to your husband. Many have suggested you read the Quran, and I applaud that, but I would also urge that you read your Bible. In it there is much advice on the role of a Christian wife, and always it points to submission, respect, and honor towards your husband. For the glory of GOD, do whatever pleases him so long as it does not cause you to sin. insha allah im marrying this week. I choose the girl who believe in Islam. and we both are studying more about islam after marrying it continues together forever..we have a strong foundation. both family's are supportive. My advice is study more about the Religion read the quran and its meanings non-Muslim do research think and think what religion is more truthful and follow the rules. not the religion that best fits in. (Remember: Knowledge source is Very very important) specially on the World Wide Web. in my opinion-Wearing hi-jab does protect Muslim woman and other men in many ways. Most powerful thing we have is Our brain gave to know our god. and Our heart gave to love our god..! May allah Bless you all and guide us to the straight path. Hi -eli81 i was wondering if i could get some advice! Me and my boyfriend of a year and half have broken up. He is muslim and says that if we want to get married i need to convert to islam and I cannot as my believes are different we are in love and both of us are heart broken I would do anything for him but i just cannot become muslim is there any other way do you no ?? He is 20 and I am 18.
tess, I think the two of you are not compatible, since you are both very attached to your separate beliefs. I have to mention once again that I do respect Azul on this ground. My second stand point is that Muslim men can marry Christian women as they are mentioned in their books. Whereas a Muslim woman cannot marry a Christian man unless he converts to Islam. We Christian men are NOT mentioned in Koran and therefore not people of the Books! God created humans alike and we are HIS greatest creation - then why this difference? Both Christian man and woman needs to convert to Islam to marry Muslim people. Why not they convert to Christinity whenever the glaring issue of inter faith marriage comes in? Why the submission is expected only from Christianity? I again repeat that we Human Race is God's greatest creation - then why this difference? Certainly Christian men are not people from hell if not mentioned in their Books as we are God's creation too! Anthony, you are wrong in your assumptions. Christian men are also People of the Book and accorded a special status by Islam. But they are not allowed for marriage because often the woman follows the religion of the man. I don't know why these objections sometimes come up. True, Allah created us all equal. The Prophet Muhammad (pbuh) said, "All of you are children of Adam, and Adam came from dust." We must respect all human beings, and treat all human beings with dignity and justice. But that doesn't mean that we should marry all human beings. Marriage is deeply personal and it must be done according to the guidelines of one's faith and conscience. You ask why Muslims don't convert to Christianity. The answer is simple: because we believe that Islam is true. We believe in our religion, we believe in the Quran, we believe in the Prophet Muhammad (pbuh). We also believe in Jesus (pbuh), who is called 'Isa in the Quran, but we believe that his true teachings have been changed and corrupted by those who call themselves Christian. The Quran, came in, part, to correct many of the mistakes of the Christians. Therefore it would not be appropriate to a Muslim to convert to Christianity. It's a free world. No one is forced to make choices they don't believe in. If a Christian does not want to convert in order to marry a Muslim, fine, do not convert and do not marry her. There are other women in the world. One thing should be kept in mind that each religion has different interpretation of how the judgement day will be. Therefore I am surely not going to accept your judgement day as My judgement which is different from yours obviously. As far as who is in the right path is concerned - God knows the best and people who are judgmental themselves to call other religions' people as Kaffirs are surely to be judged very bitterly in front of God on that very day... God has not given a mortal beingthe power to judge his creations and label them as Kaffirs or whatever... This is the very first and foremost sin that people are insulting God's greatest creation - THE HUMAN BEING! Yes you are right that no one is forcing anyone to leave his/her religion... and as far as embracing another religion - I would say that it is a very foolish thing to do. I know my religion very well and the teachings too so it really doesnt matter what other religions' people say... as they never know what are the teachings my religion pronounce. Therefore being judgmental and proclaiming that 'his/her' religion is wrong is the biggest nonsense one is uttering not knowing 'his/her' religion and the teachings. Remember being Judgemental yourself is the greatest sin as the Judgement lies only in the hands of God and not with us - mortal being. Time will proclaim who is right... and I too must declare that hope it is not going to be too late for many! Well said Anthony! You Took the words right out of my mouth. hello, im christian girl but im in love with a Muslim man. The answer to your question, is No you do not have to! and if your husband is truly a Muslim he should know this. The Holy Qur'an, Surah 2, verse 256, says, There is no Compulsion in RELIGION. To the nonsense of your husband, Muslims are told that the guiding principle should be that there should be no compulsion in the matter of religion. The presumption that this passage was directed to the early converts and that it was abrogated later on is utterly baseless. Your Muslim husband should respect you and your religion. When you have questions, and the answer you get from your husband is not clear. You can go to the nearest Masjid in your area and speak to the Imam and get the correct answer to your questions. And as a suggestion get yourself a Qur'an translated by Abdullah yusuf Ali, or Interpretation of the meanings of The Noble Qur'an in the English Language, by Dr. Muhammad Taqi-ud-din Al-Hilali and Dr. Muhammad Muhsin Khan. This will help you have a better understanding of your husband's religion. We Muslims worship Allah - the only one GOD who created you and me and all that exists. The GOD of Adam, Noah , Abraham, Moses, Jesus, Muhammed (peace be upon them) and all. why did Jesus(peace be upon him) the son of Mary (may Allah be pleased with her) came to this earth? Jesus came to teach people about ALLAH. He came to teach people to worship none but ALLAH alone without associating any partners with HIM. Allah alone deserves to be worshiped. HE has no father, mother, brother, sister or son. HE is not like us. "Allah-us-Samad (The Self-Sufficient Master, Whom all creatures need, He neither eats nor drinks). "And there is none co-equal or comparable unto Him." what is the purpose of this life? just study, earn, marry, children and die or there is more to it? Do you know that this life is temporary?? and we will die and will be raised up again and there is going to be a day of judgement? Please Research about Islam. See how it makes sense inshaAllah. I want you to be saved from the hell fire and enter Heaven so I invite you to Islam. May Allah grant us success! May peace and blessings be upon our Prophet, his family and Companions! aservant, your comment is utterly bizarre. At first I assumed you were a Muslim, since our testimony of faith begins with, "There is no God but God." We are pure monotheists, worshiping God only. We do not worship idols - in fact Islam came to abolish idol worship. Our primary objection to Christianity is that Christians have deified a man - Jesus, peace be upon him - and worship him besides God. Some Christians also worship Mary and the saints. Christianity is essentially polytheistic. The Bible verses you are quoting are an argument against Christianity and in favor of Islam. cartierlovejesduas He must be completely unaware of Boys State, which is an American institution and does the pretty much the same thing as the camp in Norway. cartierlovejesduas 37. WHERE ARE THE EASY CHAIRS, DAN? DO YOU HATE EASY CHAIRS?! cartierlovejesduas I haven't heard of a more absurd suggestion! cartierlovejesduas Essays like this are so impoartnt to broadening people’s horizons. cartierlovejesduas Cecília,Se vc puder esperar é melhor, mas à principio, não encontrei nenhuma descrição sobre interações. cartierlovejesduas This really is such a excellent resource that you are supplying and you give it away for free. I appreciate seeing websites that understand the value of providing a prime resource for cost-free. I really loved reading your post. Thanks!